KUALA LUMPUR, Malaysia (AP) — Malaysia deported 20 Taiwanese criminal suspects to Taiwan on Friday despite Beijing’s request that they be sent to China, amid an ongoing battle over jurisdiction involving the self-ruled island. A Malaysia official said another 32 Taiwanese suspects sought by China also will be sent to Taiwan. A Taiwanese Foreign Ministry statement said the 20 suspects, who were detained on suspicion of committing wire fraud, had boarded a plane bound for Taiwan on Friday. Malaysian officials had delayed the flight, saying they were awaiting legal approval, but the Taiwanese foreign ministry said the plane was allowed to take off late Friday afternoon. Taiwan’s statement Friday evening said its officials were actively engaged in talks to pressure Malaysia to allow another remaining 32 suspects to be deported to Taiwan for investigation. Later Friday, a Malaysian government official said the country has decided “to send the suspects back to their respective countries to be dealt with accordingly.” The official spoke on condition of anonymity because he wasn’t authorized to speak to the media. The latest battle over Taiwanese deportations came after Kenya sent 45 Taiwanese suspects to China instead of Taiwan. Beijing wants to investigate them for defrauding victims in China by posing as police officers and insurance agents over the phone in order to obtain banking details. China claims jurisdiction in such cases where the victims are Chinese, and says the perpetrators aren’t given due punishment when they are returned to Taiwan. The Malaysian official said a total of 120 foreigners — 68 from China and 52 from Taiwan — were detained last month in connection with a scam. He said two masterminds from China were deported April 13. China then requested for all the remaining 118 to be sent to the mainland, on grounds that the scam involved 600 victims in China, the official said. The official said China reiterated its request to Malaysia on Friday after the 20 Taiwanese were deported to Taiwan. But he said Malaysia, which has no extradition treaty with China or Taiwan, is not obliged to accede to Beijing’s request. Taiwan has protested that Kenya violated the legal process and accused Beijing of violating a tacit agreement not to interfere in each side’s citizens’ legal affairs abroad. A Taiwanese delegation is expected in Beijing soon to negotiate the matter. Some see China’s moves as attempting to assert its claims to sovereignty over the island and legal authority over its residents. The sides split amid civil war in 1949 and China has long sought to isolate Taiwan diplomatically by preventing it from maintaining formal ties with most countries, including Malaysia and Kenya. China’s economic cloud lends it political influence. 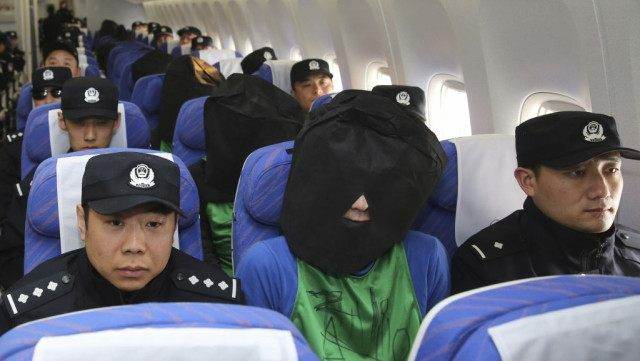 Chinese state broadcaster CCTV has covered the Kenya deportations extensively, with suspects shown being led from the plane in prison smocks with bags over their heads. Others were shown in front of police and television cameras confessing to their crimes and apologizing to their victims. Associated Press writer Christopher Bodeen in Beijing and video journalist Johnson Lai in Taipei, Taiwan, contributed to this report.